Well, sort of. The US Congress ruled in 2011 that the amount of tomato paste in pizza sauce meant that pizzas could be counted as a vegetable and included in school lunch programs as one of the little 'uns five-a-day. Nice one, America. And it's literally called the 'Pizza theorem'. Used in elementary geometry, the pizza theorem allows you to work out the equality of two areas that arise when you partition a disc in a certain way. It's called the pizza theorem because it mimics the technique traditionally used to divvy up pizza into slices. It's also pretty complicated, so we won't get too muddled into the dark number-y underbelly of it all. But basically: if two people were to split a pizza sliced in a manner according to the nitty gritty of this theorem, taking alternating slices as they go along, then they would each get an equal amount of pizza by the end. Which is the just the sort of maths we can get behind. 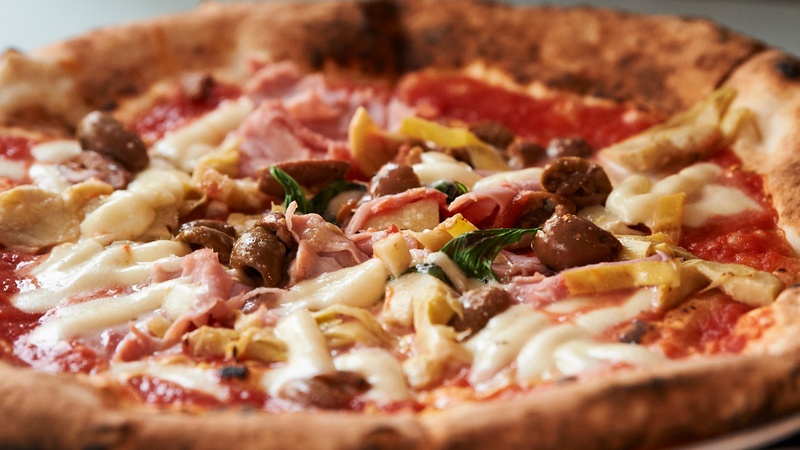 A recent survey of 2,000 adults in the UK, commissioned by PerfectHome, found that 45% of the Brits surveyed said that they would choose pizza over all other types of cuisine when ordering a takeaway. That statistic increases to 50% when narrowed down to just London, underlining the capital’s unrelenting passion for all things pizza. Yes, as if Hawaiian pizza wasn't controversial enough, it turns out that it's name is also somewhat more than a little misleading. In fact, it's just a blatant lie, really. Located a hell of a long way from Honolulu, Greek-Canadian Sam Panopoulos is the man who is regularly cited as having created the world's first Hawaiian pizza at his Ontario Satellite Restaurant back in 1962. The savoury and sweet topping has since gone on to cause endless pizza party debates over the decades. Everything is bigger in Texas. Even the pizza. The Moontower Pizza Bar in the Texas town of Burlson has claimed the record for the world’s largest pizza commercially available with its nearly 2m long cheese-topped construction. Dubbed 'The Bus' because of its overwhelming size, the pizza measures in at 1.98m² and is cooked in a rotating oven for a mere half hour before its then placed in a custom-made box and sent out for order. The Bus costs roughly £230, includes a single topping and requires a 48 hour notice before you want it delivered. Which is pretty fair, to be honest. I mean, it's the sort of pizza that could feed an entire village. Just maybe not a Texan one. The written word "pizza" first appeared in a Latin text from a little Italian town in 997 AD. The text apparently stated that a tenant of a particular property was required to give the bishop of the town twelve pizzas every Christmas Day, and another twelve every Easter Sunday. That sounds like a pretty sweet deal for the bishop to us. The future is now, people, and it's coming in delicious printed food form. Tech startup BeeHex has been harnessing technology to 3D-print pizza. Funded by a $125,000 grant from NASA in 2016, the printer's intended purpose was to create a way for astronauts to make their own personal pizzas while out on missions. The nifty little robot can 3D-print and bake a pizza in six minutes, making the robot uprising only all the more inevitable.